Football is back and what better way to spend a pleasant September college football day in…New York City? True, NYC may not be the first place you think for college football, but there is a team that plays right in Manhattan. 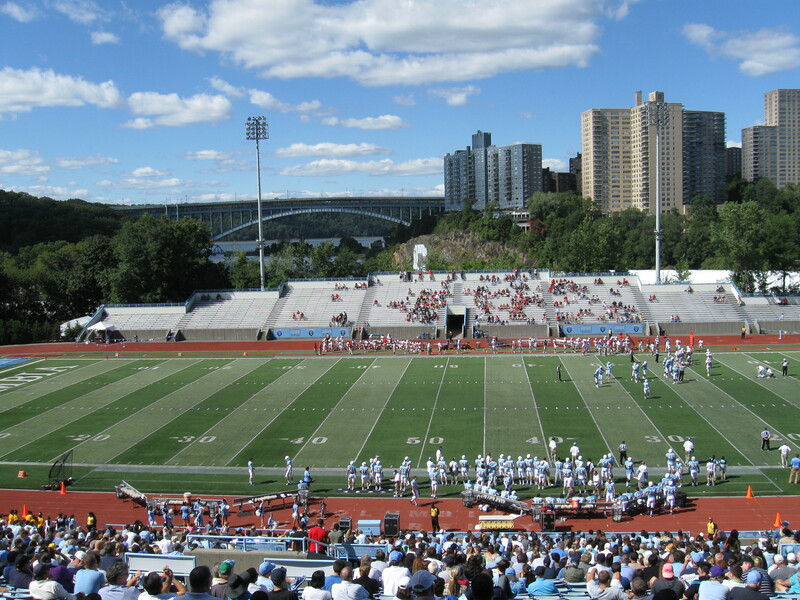 Out of the Ivy League, Columbia University calls Lawrence A. Wien Stadium home and I made a visit as they opened the season against Marist College. Getting to the game was my biggest challenge as there is no general parking for the stadium. Mass transit is widely available, but I would be doubling my time if I decided to do go that route. Given that I was headed to the Northern tip of Manhattan, in the neighborhood of Inwood, I looked into possibly driving for the first time in my seven years living in the region into Manhattan. After scoping out a parking garage within walking distance, I got up the nerve to do it. Not something I would like to repeat, but I made it, surviving classic NYC driving full of cars blocking intersections, right lanes taken up by buses and rude, honking drivers swerving in and out of lanes. I gave myself plenty of time and walked the Inwood section a bit, stopping at Park Terrace Deli for a pretty good sub (“The Godfather”, which was roast beef, provolone, onions and horseradish on a hero). They let you bring food into the stadium, which is great, so that was going to be my lunch at the game. In fact, there are a lot of things that Columbia does well and that includes keeping the prices down. An awesome pre-game picnic just outside of the concourse features free water, soft drinks and beer. That’s right free! Plus they have some local restaurants in the area giving away free samples, that you could make into a light lunch. Heading into the stadium, it reminded me a bit of Cornell and had that old feel….but it was actually built in 1984. The south sideline is where the bulk of the seating is and there are over 10,000 seats here with the bowl arcing very slightly at the top. A couple not-so-great things were the scoreboard and the maneuverability. I really liked the scoreboard design, but I couldn’t read the darn numbers in the sunlight! I wasn’t the only one either as fans kept asking each other the time, because it was too hard to see. There is a track around the stadium, but they don’t let you walk on it (like at Penn and Bucknell). So to go to the other side, you need to exit the stadium and walk all the way around, re-entering in the process (with a stamp on your hand). As for the big plus with the Stadium…a great view. Sitting in New York City, you would not expect a canopy of trees, but from the main seating area, a peaceful view of Inwood Hill Park can be seen. Straight ahead is the Hudson River spilling into the Harlem River, along with the Henry Hudson Bridge, then to the right are those towering apartment buildings that are so familiar with the city. It’s a nice setting for football. And surprisingly, the Lions sent the crowd home happy! Columbia and athletics haven’t exactly been great together and football has endured a lot. No solo Ivy League championships, a 44 game losing streak in the 80s and a winning season that hasn’t happened since 1996. That’s why I was surprised to see a decent crowd on hand (despite the low attendance number, the 3,933 looked like more, when it’s usually the opposite). Fans were cheering nicely and gave nice support as many stood during the critical plays. Good to see optimism with the first game of the year. Initially, it wasn’t looking to go Columbia’s way after a 3-0 deficit at the half. But they came down and scored a touchdown, followed by a botched punt attempt by Marist and a Columbia field goal to start the the third quarter. Toward the end of the third, Marist was about to go in for a TD at the 1, but they fumbled. Columbia was just hanging on until a Marist score with 6:30 left. But they blocked the extra point!!! Their 10-9 lead held up and a couple big defensive stops gave the Lions the victory. All-in-all a great day in NYC and we can check off the fourth Ivy League stadium from The List. For a more in-depth review check out the details at: #127 Lawrence A. Wien Stadium and also, there will be a review posted over at Stadium Journey soon. Making your way through the Ivy League. I love it! Thanks Paul! Definitely the most attainable league to check out for those living in the Northeast. With all this ridiculous conference re-alignment, it is very refreshing to see a league remain in tact and based on geography and natural rivalries. I highly recommend checking out one of these historic Ivy Stadiums!